Bleach is similar to Naruto, in that it’s a popular series that has lost a lot of fans in recent years. Like Naruto, there is a tendency for people to dismiss Bleach as another overhyped series that has outstayed its welcome. And this would not be entirely untrue, but again, like Naruto, Bleach would not still exist if it had been a bad series to begin with. So it must have done something right. 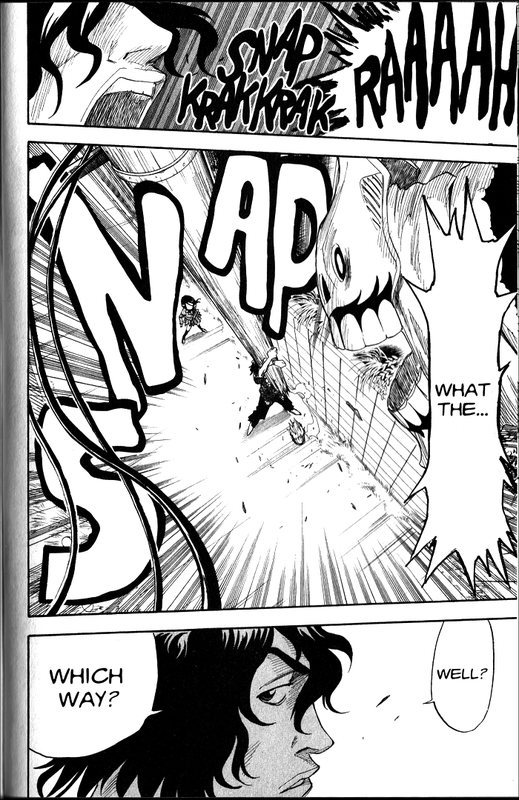 And as with many shounen manga, the answer lies in one of the most crucial aspects of the genre: its fight scenes. 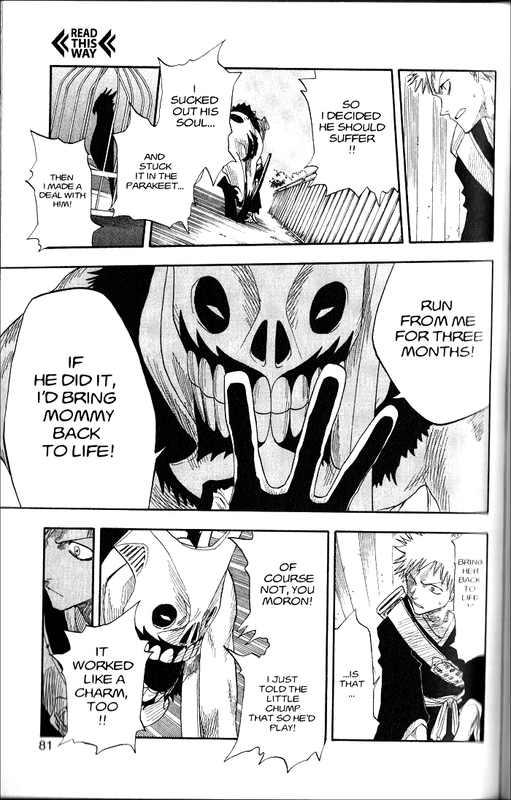 As a monster of the week series, it was essential for Bleach in its early days to capture an audience with interesting villains, and to find ways for those villains to be defeated in a manner that showed off its characters’ strengths and got the reader interested in reading the next chapter. To do this, some writers rely on cliffhangers, or introduce a new element at the end of the story to lead readers on to the next. Bleach, on the other hand, enticed the reader back each week by providing well-contained short stories that stood out on their own. Chapters 9–12 provide the climax to a completely self-contained story. Instead of introducing a new thread at the very end of the story, Kubo instead finishes it and lets it stand on its own. He banks on the story being well-written and well-received enough that the reader will want to read more, not just because he wants to find out what happens next, but because he anticipates the next story being just as good. Prior to the final battle, Ichigo’s friend Chad has been running from an unseen enemy. Rukia and Ichigo manage to find him, and engage the enemy (a Hollow) in battle. The scale of the fight is small, but even a more intimate fight can take on real gravitas if the author sets the right stakes. In this case, the stakes are the lives of not only Chad (someone Ichigo has a personal connection to), but also that of a small child. In these chapters, the Hollow reveals that he was a serial killer in real life who died after the child, Yuichi, tripped him off a balcony. As revenge, he’s been tormenting Yuichi with false promises of returning his dead mother. This Hollow is more distinct than the series’ previous enemies. He is not a mindless monster, consuming souls on instinct alone, nor is he fueled by resentment against a loved one. He is the first real monster that Ichigo encounters as a Soul Reaper—one that was evil, even as a human. He is built up by the narrative only to be hated, which makes his eventual defeat all the more cathartic. Kubo knows well how to represent motion with his drawings and panel layout. He gives the scene an almost cinematic quality, and unlike in his later work, he wastes no space just for the sake of looking good. Still, he knows when to indulge in a little more space to make particular movements dynamic. 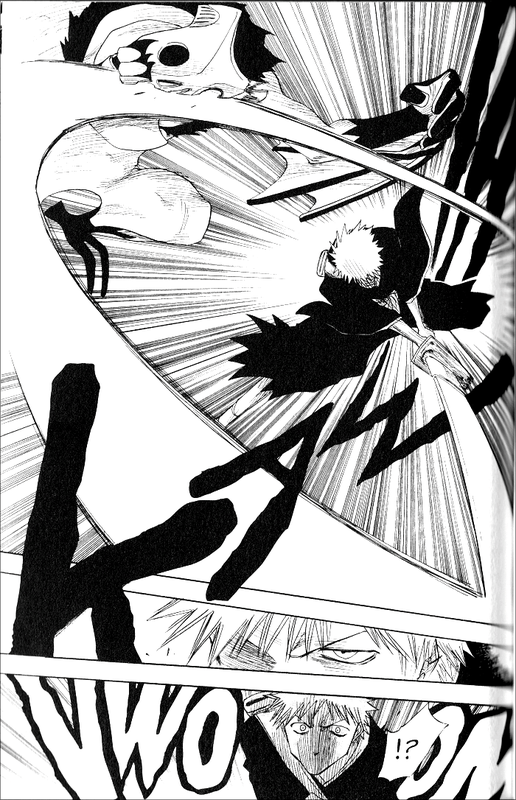 Ichigo’s final blow against the Hollow easily ranks among the better final blows in manga. His sword itself is not seen. Instead, the entire focus is on the motion, allowing the reader’s mind’s eye to truly see the motion of the blow. 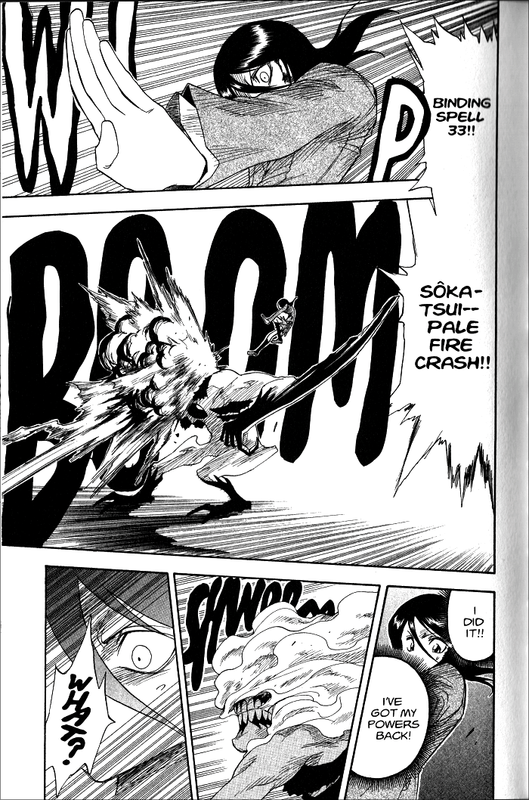 The downside of this fight is that Kubo robs the Hollow’s “leech bomb” attack of some of its threat by allowing Rukia (who has none of her spiritual powers at this time) to survive two blasts, so that later, when Ichigo is covered with these attacks, there is no real sense of danger. He is in so little danger, one can imagine the HP bar hovering above his head. 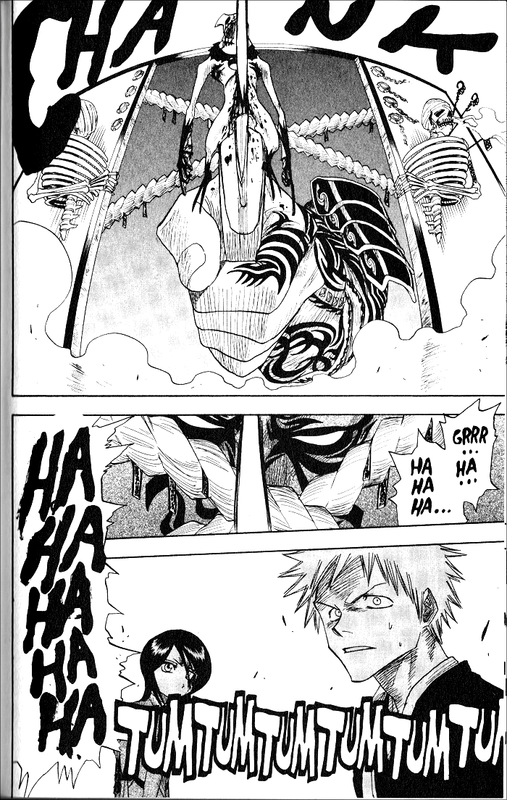 So even though the vision of Ichigo shoving a handful of leeches into the Hollow’s mouth is the epitome of badass, its effect is weakened by our knowledge that he could have just let the blast go off and would have come out of it, at worst, slightly singed. Kubo knew what he was doing, early on, when he chose to focus on individual fights with their own mini arcs. His style complemented this “all battles all the time” approach. 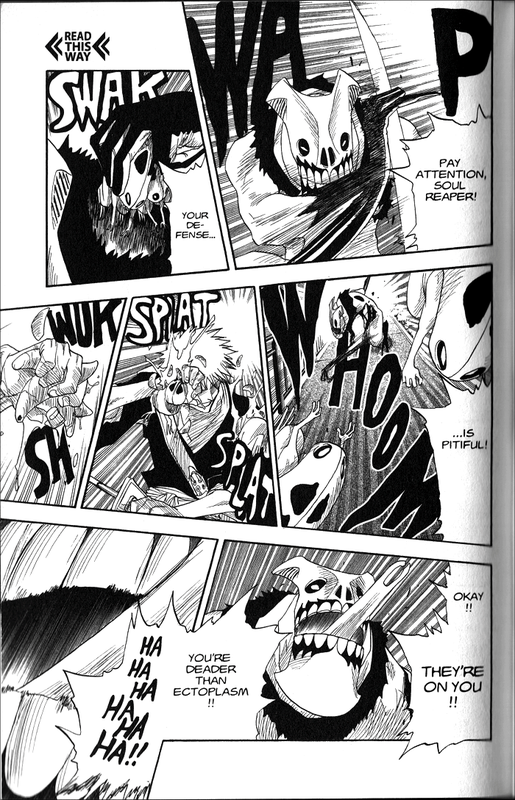 And chapters 9–12 are prime examples of what Kubo looked like at his best. He knew how to put the right stakes on the line, and even if it was clear that Ichigo would not lose, there was still enough “cool” to keep that lack of danger from dampening the enjoyment of the chapters’ climax. Remember to check out the awesomeness that is Derek’s Blog. Burning Lizard Studios. Fight scenes are practically synonymous with manga and anime. Few people can think of anime without thinking of two over-muscled men throwing energy beams and punches at each other while screaming for minutes on end. These people are wrong, and most likely stopped paying attention to anime and manga back when Dragonball Z first came out in the west. Not only is there obviously much more to manga than fighting, but even shounen manga, the posterboys for fighting series, go beyond two muscled mastodons beating the crap out of each other. Fight scenes in manga can range from straightforward, brutal beatings to calculated strategic encounters between two opponents. The purpose of this column is to explore the many flavors of fight scenes found in shounen manga, as well as some shoujo and seinen manga. For many manga fans, Naruto was one of the first series they ever read. And while the series’ value is hotly debated among the various camps of manga fans, it cannot be denied that in its early run, Naruto was very different from the typical shounen battle manga. Fights were developed and executed in a much more cerebral way, making them far more interesting to read. The most indicative of this style is in volume two, chapters twelve to fifteen—the first fight against Zabuza. 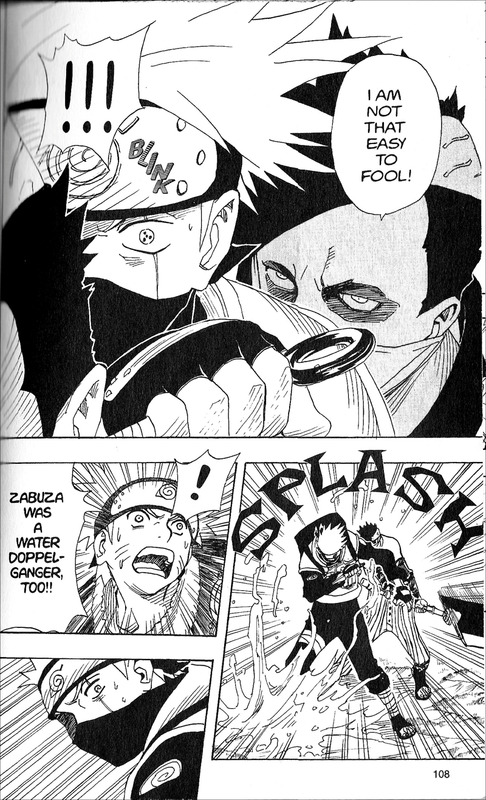 The fight begins with Zabuza being set up as a serious threat, both through his actions and the words of others. He is shown as being on par with (and momentarily superior to) Kakashi, who until this point has been the strongest ninja in the series. With Kakashi (a ninja who has already bested Naruto and his team) incapacitated, the protagonists find themselves facing an opponent they cannot best physically. So they do what they did not do when fighting Kakashi; they use teamwork and tactics. 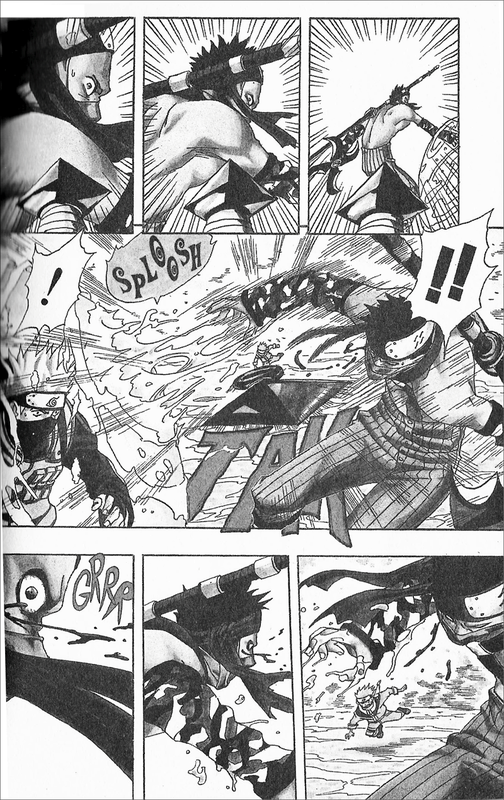 The climax of the fight involves Naruto using a complex strategy involving turning into a throwing star to get get behind Zabuza and free Kakashi. Some might say that Naruto and Sasuke failed, as Zabuza was taken down by Kakashi in the end. And they would be correct, if not for the fact that the purpose of the fight was not to defeat Zabuza, but instead to free Kakashi so that he could defeat Zabuza. With this goal accomplished, the fight was a success for Naruto and Sasuke. And since two twelve year olds taking out an adult is ludicrous, this is essentially one of the only ways to have resolved the fight while remaining believable, or as believable as any shounen manga ever gets. Masaki Kishimoto understood his characters’ limitations, and set up a battle in which they could be victorious while still remaining true to those limitations. The fight focuses on intelligence over brute force, and if one thinks of fight scenes as a mystery plot in which the mystery to be solved is how the opponent can be defeated, then it becomes easier to determine what makes a good fight scene. No one would ever consider a mystery story where the protagonist stumbles upon the answer rather than working it out for themselves to be a good example of the genre. Likewise, sudden powerups only work to a fight’s detriment. 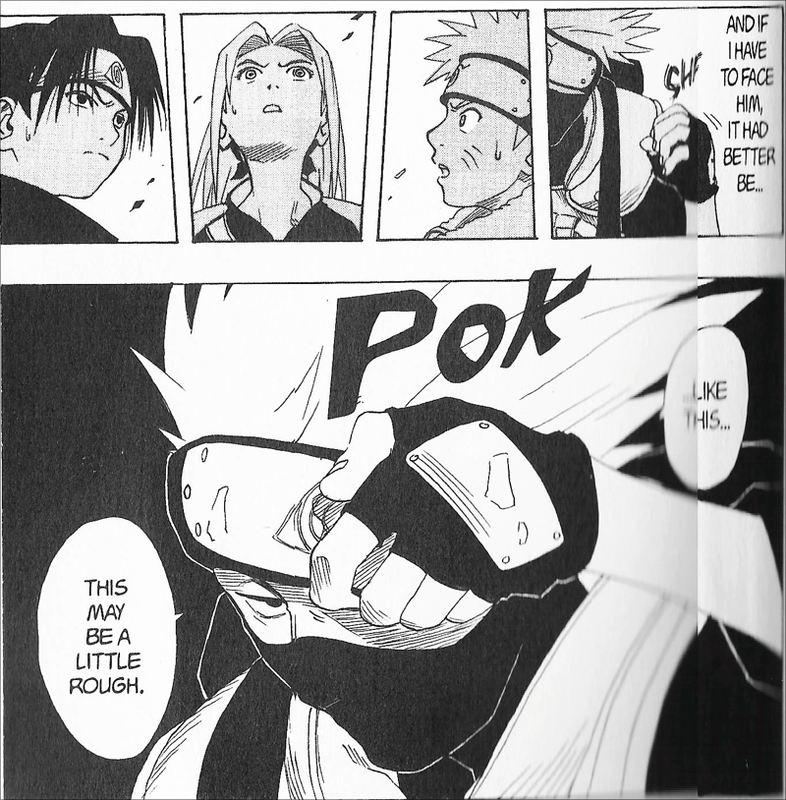 What sets Naruto apart in the early chapters is that most of the fight scenes progress like the fight against Zabuza did, with focus being given to fighting tactics rather than power levels. The way opponents are defeated involves intelligent solutions more often than not, which makes the fights more intellectually stimulating than their cousins. Derek Bown writes anime and manga reviews at Burning Lizard Studios. If you have any fight scenes from manga you want him to look at, mention them in the comments.